Sold in September 2016, the 80.2 metre motor yacht Golden Odyssey II is back on the market, renamed Grand Ocean and listed for sale by SSH Maritime. Built in steel and aluminium by German yard Blohm + Voss to a design by Platou Architects, she was delivered in 1990 and in 2015 completed her 25 year Lloyd's class survey including a total rebuild of both main engines. A voluminous interior with luxurious decor by Alberto Pinto accommodates 14 guests in seven cabins, featuring vast his and hers separate master suites, both with en suite bathrooms and dressing rooms. The remaining cabins consist of a double and four twins, all with full en suite facilities. In addition, she has quarters for 29 crew. The main dining room comfortably seats up to 18 guests and features a spectacular live aquarium backdrop while a variety of exquisitely appointed guest lounges give flexibility for privacy or entertaining large groups of guests. Up on the sun deck of this yacht for sale, a vast mosaic swimming pool with counter current is lit at night by hundreds of fibre optic lights and links to the aquarium in the saloon below. Other features include an owner’s private deck boasting a Jacuzzi and sunbathing area, and there is a gymnasium on the top deck. 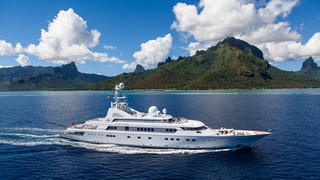 She has an extraordinary range of 9,100 nautical miles at 12 knots, courtesy of twin 2,868hp Deutz-MWM diesel engines. Grand Ocean is asking $39,900,000.